David Alden's new production of Richard Wagner's Lohengrin at Covent Garden replaces Elijah Moshinsky's 1977 production, which could hardly have been expected to last so long. Whereas Moshinsky took a semi-abstract neo-pagan approach, Alden has set his in the context of a fairly specific place and time in the early to mid 20th century. We caught the second performance, on Sunday 10 June 2018, with Klaus Florian Vogt as Lohengrin, Jennifer Davis as Elsa, Thomas J Mayer as Friedrich von Telramund, Christine Goerke as Ortrud, Georg Zeppenfeld as King Heinrich and Kostas Smoriginas as the Herald. Sets were by Paul Steinberg, costumes by Gideon Davey, lighting by Adam Silverman, video by Tal Rosner and movement by Maxine Braham. Andris Nelsons conducted. From the opening notes of the prelude (played with the curtain down), it was clear that Andris Nelsons' way with the score was going to be something special. He drew ravishing textures from the orchestra, creating moments of great beauty and real transparency. Even the more bombastic sections, with all the extra brass, seemed brilliant rather than heavy. This combined with a lithely dramatic, flexible approach to the piece gave it a fluency which it does not always have. This complemented the two principals aptly, as neither Klaus Florian Vogt nor Jennifer Davis has a large scale voice. Whilst in no way period, this was a very much a performance which viewed the work from its own time, rather than through the prism of later Wagner operas with heavier, more dramatic voices. David Alden's production set the piece within the context of a middle European country during the 1930s, as with many modern productions the fact that the German Empire is at war became an important factor in the proceedings. 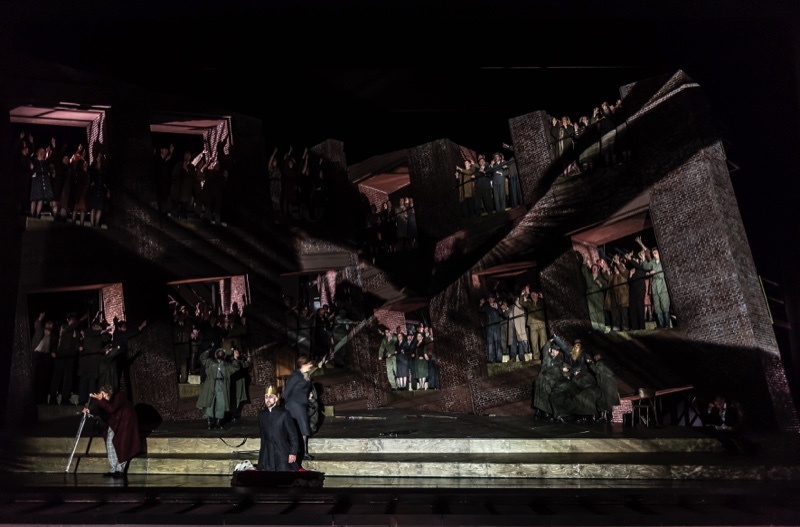 Paul Steinberg's sets were a flexible group of quasi-Victorian warehouses which we saw front and back, moving the setting between brick arches and metal superstructure, with neo-fascist swan images to provide dramatic context. The production was very strong on visual images, the lowring arched walls in Act One, the huge neo-fascist swan monument in the closing scenes of Act Two and the massed ranks of soldiers in the swirling mists at the opening of Act Three. Alden's direction had many of his usual ticks, but overall the result seemed to add to the atmosphere and the production seemed far less contrived than some of Alden's past work. 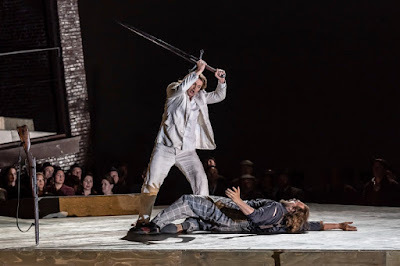 For Lohengrin's arrival, there was no physical swan, just a stunning video from Tal Rosner which seemed to take over the whole stage, the setting then cracked and Klaus Florian Vogt's Lohengrin appeared. Rather daringly he sang the farewell to the swan facing the rear of the stage. Rarely have I heard this sung so beautifully. 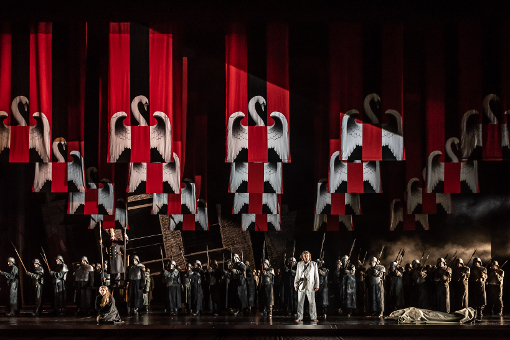 Vogt's Lohengrin was otherworldly and naive in his expectations of how people would react. Whilst Vogt's tone had enough heft to dominate where necessary, it was the way he dared to sing quietly and beautifully that impressed, and his account of 'In fernem Land' in Act Three was both beautiful and moving. It helped that in Jennifer Davis, he had a young looking and young sounding, truly jugend-dramatisch Elsa. This Elsa had all the youthful idealism and strength of character the role needs. Elsa starts naive, with a dream of her magical knight, but the reality is somewhat different. Whilst Christine Goerke's powerful Ortrud planted the seed of doubt, the crucial duet in Act Three showed how Vogt's Lohengrin and Davis's Elsa had completely different and competing expectations. It was here that Davis showed real sense of purpose. If the Lohengrin and Elsa, the light couple, were youthful, high and bright, the dark couple, Telramund and Ortrud, were powerful and dramatic. Christine Goerke brought raw power and strong personality to Ortrud. In her Act Two scene with Else, she also showed the insinuating side to Ortrud's nature, but this was followed by the terrific invocation to the pagan gods. There were moments when I wished that Goerke would have brought more edge to her portrayal (like Susan Bickley at Welsh National Opera), but Goerke succeeded thanks to strong personality and sheer power. Thomas J. Mayer's Telramund was a powerful man rendered weak by his desires, the man of action being no match for the wiles and seductive purpose of Goerke's Ortrud. I have to confess, though, that I found the later scenes in Act Two had a tendency to sag somewhat, perhaps because David Alden was interested in the context of politics rather than making the dialogues be about personality and power. Georg Zeppenfeld portrayed King Heinrich as a somewhat weak man, very dependent on the support he was anticipating from a strong leader in Brabant, and Zeppenfeld gave a dramatically riveting performance. Kostas Smoriginas was in strong voice as the Herald. The Covent Garden chorus and extra chorus were in terrific voice, filling the stage with sound in an opera which very much depends on the choral contribution. The tricky chorus which precedes Lohengrin's entry was admirably done, with the crisp clarity of the performance for once enabling us to hear the music clearly. Similarly, the orchestra was on superb form, creating Andris Nelsons shimmeringly transparent textures, or lithely dramatic climaxes. This was a performance to be treasured, and clearly, Nelsons is able to get the best out of both chorus and orchestra. 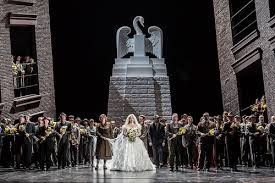 Lohengrin is a long opera but this just sped by, with music and drama combining to create a single lithe whole, which mixed purposefulness with moments of spectacular beauty.